The beautiful old capital city of Luang Prabang in northern Laos is a true gem in Asia. Having first visited in 2010, I was charmed by its peaceful, calm streets lined with cute French colonial buildings. The town is located on a peninsula, where both the Mekong river and Nam Khan river meet, offering wonderful viewpoints at every corner. One of my favourite things about Luang Prabang is the lack of motors and noise. It is such a relaxing place to visit and so accessible – tourists and locals go about their daily business side by side. There’s no hassle, no tackiness, no horn honking – and with this, the town attracts the best kind of vistors. Luang Prabang feels like nowhere else I’ve been to in South East Asia, and despite its beauty, it is not yet overrun by tourists. If you’re looking for a little inspiration on why to visit or what to do if you’re already heading there, then read on for my top reasons to visit! Such beautiful buildings line the streets and temples just pop out of nowhere. There are more than 30 active temples in the town, many of which tourists are welcome to explore, as long as they are respectful and cover up inside. One of the most opulent temple complexes in the town is Wat Xieng Thong. This is where royal coronations traditionally took place, and offers a fascinating insight into the Buddhist religion. I’m partial to a nice coffee and cocktail, and with its French colonial heritage, you can really enjoy some brilliant cafes in Luang Prabang. Waking up to an aroma of freshly baked bread is a good start, before wandering to a roadside cafe for an excellent coffee and breakfast. A little slice of Europe amid temples, monks and the Mekong river – perhaps I’m charmed by the unusual contrast. Either way I love it. Some of my favourite include the Joma Bakery, the Chang Kham bakery and the Ock Pop Tok Silk Road Cafe. 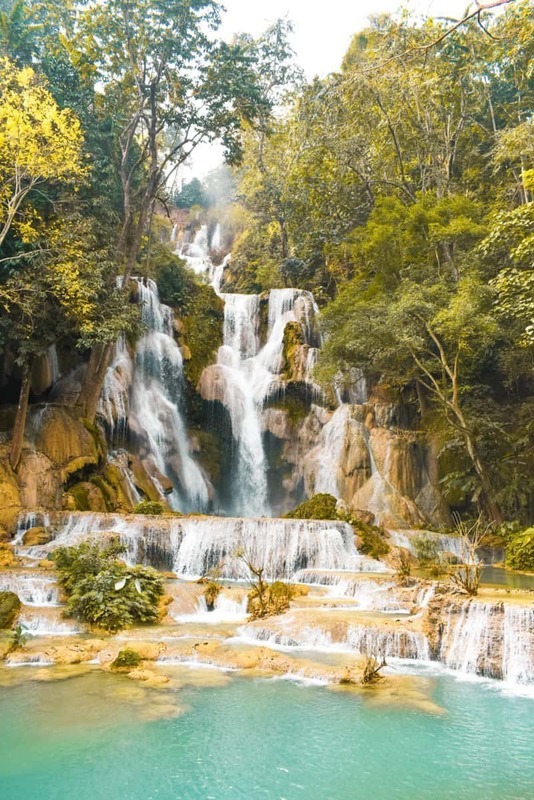 Located about 30km out of town, the beautiful Kuang Si falls are one of the most popular attractions in Laos. Arriving early is highly suggested, and in the summer months, it is easy to spend a full day there jumping in and out of the water. At the entrance to the waterfalls, there is an amazing bear sanctuary, the Tat Kuang Si Bear Rescue Centre. The bears are so playful and amusing to watch, definitely don’t skip! It’s a landlocked country, but by no means does Laos not get its fare share of amazing sunsets. Luang Prabang offers a number of spots to watch the sun set, such as Mount Phousi, which is probably the most popular. Many locals also offer boats trips to sail the Mekong which certainly looks relaxing. However, my personal favourite spot is soak up the amazing scenery from a riverside cafe. Every single day, before sunrise, the town’s resident monks leave the temples, creating one of the most iconic images of South East Asia. Single file, the robed monks walk barefoot through the city collecting food donations in their basket. Not only is it a hugely important aspect of their culture and daily life in Luang Prabang, but a really interesting and unique way to participate in the town’s activity. Any tourist is welcome to purchase sticky rice donations and join in at the side of the road. Just remember to be respectful – so camera flashes off and don’t speak to the monks! Every evening from 5 to 10pm, hill-tribe traders and local vendors come to the main street in Luang Prabang and set up the stalls or floor displays. South East Asia has many many night markets, but Luang Prabang’s is up there as one of the best, in my opinion. The displays are beautiful, where you can buy everything from hand-painted art, wood carvings, jewellery, clothing and other local handicrafts. Everything is great quality, but don’t try and haggle for a hard bargain. The Laos people are highly unconfrontational and will shy away from heavy bartering! It’s a great spot to capture photos as the streets are so lively and full of colour and people! Luang Prabang really champions local Laos food, often with a French influence, as a result of its colonial past. You’ll be hard pushed to find a lot of Western food about. We ate in several great restaurants off of the main high street, but it was actually tucked away down by the Nam Kahn river that we found Tamarind. This lovely local restaurant aims to educate its guests on Lao cuisine through informative menus and staff who are happy to explain and discuss each dish. They offer a number of set platters, offering an array of Laotian dishes, but the herbed steamed fish, served in a banana leaf was also incredibly delicious! Luang Prabang is a small town located on a peninsula, with the tip being located at the confluence of the two rivers. Not only can you take a dip in the rivers either side, but you can cross them by bamboo bridge for an explore. At the time of writing, one had a bar/local restaurant at the other end, but who knows what could be built in the future. This elephant conservation organisation is based about a 30 minute away from Luang Prabang and offers guests the opportunity to enjoy an intimate and ethical experience with the elephants. I couldn’t recommend the organisation more and have written a full blog post on my day with them here. Luang Prabang offers very little in terms of nightlife, but the hip hangout at Utopia is the best the town has. Overlooking the Nam Khan river, this bar is a great spot for a daytime beer and chill. Or later in the evening, its the best drinking spot in town. 8 years ago, the main ways into the town were either a long (30 hours for us from Chiang Mai) and treacherous bus journey through perilous mountains. Or, a famed slow boat ride down the rivers. Both of which took considerable time and patience, and required some serious shower time on arrival. Now however, there is a small, modern (and beautiful) international airport just on the edge of town, making a very quick and easy arrival. That being said, I thought a new airport and flight links would have meant the town would have become overrun with tourists, but I was delighted to see that Luang Prabang has fully retained its charm and slow pace of life. There is no shortage of small, family owned guesthouses in the town with a huge concentration of them nestled behind the main street. Many offer beautiful views of either river, or some just provide the opportunity to bed down in an old wooden colonial house. We stayed in MyLaoHome, a locally owned guesthouse with a strong focus on giving back to the community. I actually picked to stay here as 8 years ago, I stayed in its sister capsule pod hostel over the lane, and had a wonderful stay. Its location is perfect, down a quiet laneway leading to the Mekong and just a stones’ throw from the main street. About 10 metres away, it also happens to have two of the best coffee shops in town (Joma and the Chang Kham Bakery). So if you’re considering a visit so South East Asia, I couldn’t recommend Luang Prabang more and hope you found these suggestions for the top things to do in Luang Prabang useful! If you’re travelling around the country, read this post on backpacking Laos. Also, do feel free to ask any further questions in the comments section below! Great post – thanks for info ! Makes me want to go ! Definitely do! Couldn’t recommend the city more! Thank you for such an interesting post !